Digital Meat Thermometer – Top Waterproof Instant Read Thermometer with Backlight, Calibration, and Magnet. 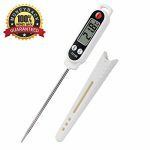 Super Fast Food Thermometer for Kitchen, Cooking BBQ, Grill! Tired of overcooking or undercooking your meats and food or waiting for your outdated thermometer to finally get a reading? That frustration can be no more with the Kizen quick and accurate thermometer! Featuring a Ultra Fast Premium Probe – Capable of taking temperatures in as little as 2 seconds with an accuracy of +/-1C. This FDA certified stainless steel probe also has an antibacterial coating to prevent bacterial growth. The instant read temperature probe by itself would make a great buy, but the Kizen thermometer goes even further with several unique and innovative features that sets it apart. • Waterproof Body – Do you frequently get your thermometer dirty and want a quick and easy way to wash it without fear? No worries, you can wash this Kizen thermometer under running water just like any of your dishes! 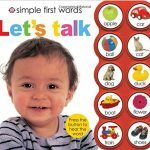 • Bright LCD Light – Do you just need a little visual assistance for the read? Don’t bother fumbling with your phone, the LCD backlight has you covered. • Retractable Probe – Enjoy all the benefits of a long temperature probe without all the storage hassles. 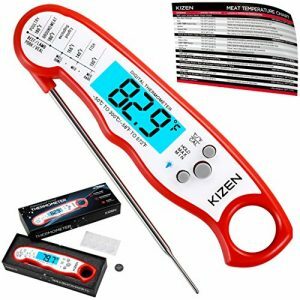 The Kizen thermometer can fully retract, making for easy & safe storage. 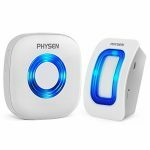 • Auto-OFF – Worry free use, featuring a convenient battery saving auto-off when probe is retracted or after 10 minutes have passed without activity. • Calibration – Comes expertly pre-calibrated, but can re-calibrated anytime to assure only the most accurate reads! 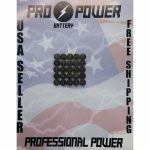 Free Bonus Extras – Gift box package, eBook, 2 3V CR2032 batteries, meat temperature guide, 4 velcro dots. Satisfaction Guaranteed – CE, FDA, and RoHS certified with a 100% Lifetime Warranty, so you can make your purchase with confidence! Don’t rob yourself of making perfectly cooked meats and food any longer! Click “Add to Cart” and cook like a pro!✅ULTRA FAST – Takes a temperature in a little as 2-3 seconds, and is accurate to +/-1 degrees with a wide range of -58℉-572℉. No more waiting over a hot stove or grill for the temperature to settle! Take out the guesswork and eliminate overdone or undercooked food, and instead make perfectly cooked beef, chicken, pork, fish, lamb, or turkey, every time! Also works great with beverages, deep frying, making candy, and baking. ✅WATERPROOF – IP67 rated waterproof, the Kizen thermometer can be washed under running water without fear! With a strong ABS plastic body, it can withstand accidental drops or other impact accidents. With a waterproof and strong break resistant body, the Kizen thermometer is highly durable and resilient. ✅CONVENIENT AND CLEAR – Get the temperature by the bright and large LCD screen instead of fumbling with your phone flash to get a read! With an internal magnet and large hang hole, you can conveniently store this where you can have easy and quick access! ✅FULLY BUNDLED WITH BONUS EXTRAS TO GIVE YOU THE MOST VALUE FOR YOUR MONEY! – Comes beautifully packaged in a premium foam lined box, making it an ideal present for any cooking or bbq enthusiast! This sturdy box is also a great place to store the thermometer to keep it safe. Also includes 2 CR 2032 batteries(1 extra as a service), bonus eCookbook “Modern Cooking” meat temperature guide, users manual, and 4 velcro dots to hang your temperature guide on the wall for added convenience! 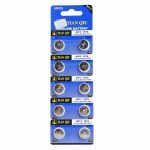 ✅KIZEN 100% MONEY BACK LIFETIME WARRANTY – Enjoy a smooth & frustration free experience with our 100% LIFETIME WARRANTY and 100% MONEY BACK GUARANTEE! With CE, FDA, RoHS certification, we stand by our products so you can make your purchase with confidence! You won’t get this kind of service and warranty from big brands like Themoworks Thermapen, Weber, Maverick, Taylor, CDN, and Polder. 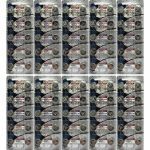 "100 Maxell Batteries LR44 (A76, AG13) Alkaline Button Size Battery On Tear Strip ""Hologram"""